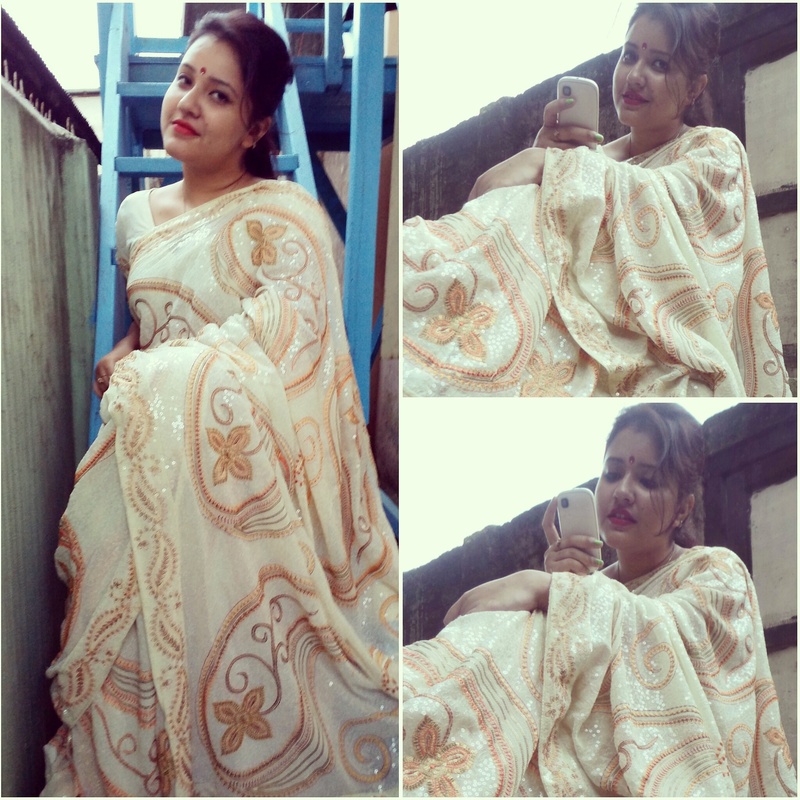 i always felt cream colour cant be worn because it might make me look darker.. Everyone has notions about particular colours you wear.. i had it bou colours like cream n beige.. untill this saree came to me. it ws a pre durga puja shopping time. me with my family were out fir shopping.. suddenly at 1 particular shop this saree was on display.. my mom saw it but she dint say anything.. saw other sarees shopped n left.. bt i guess my dad saw it.. whn we left he went back 2 dat shop.. without tellin us.. bought ths saree.. n left at the back seat of our car.. when we were leaving for home.. mom steppedin the car n saw that packet n asked wat was it.. my dad was like.. how wud i know u guys bought stuffs.. n my mom was like i haven’t bought this.. when we opened the packet it ws this sari..n we realised dt it ws my dad’s surprise for her..
i was so in love with his this gesture.. no matter how long ur married if u have love.. ur gona love dat relationship more than anything else.